BEIJING, Oct. 17 (Xinhua) -- Wang Chen, vice chairperson of the Standing Committee of the National People's Congress (NPC), met on Wednesday with Vice Prime Minister of Kyrgyzstan Altynai Omurbekova, former Italian Prime Minister Romano Prodi, former Polish President Bronislaw Komorowski and Egypt's former Prime Minister Essam Sharaf, respectively, in Beijing. These guests are in Beijing to attend the Fifth Annual Conference of Taihu World Cultural Forum from Oct. 17 to 19. 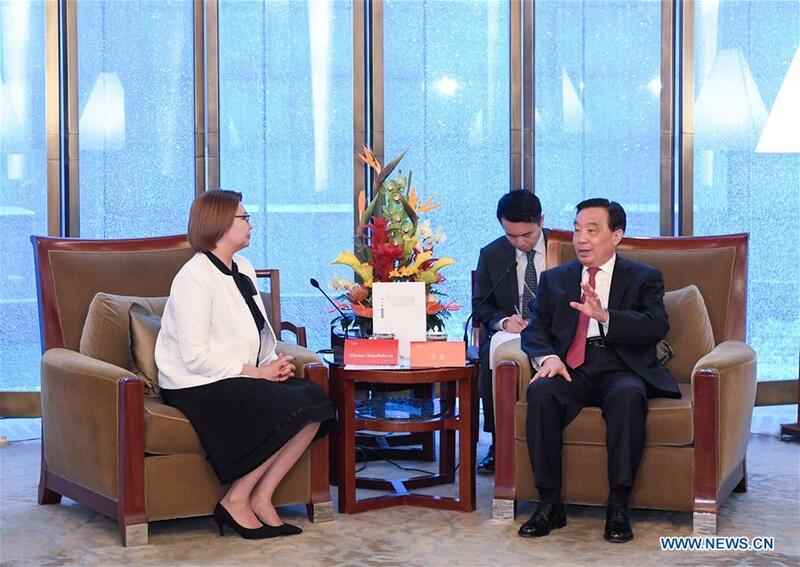 During his meeting with Omurbekova, Wang said traditional friendship between China and Kyrgyzstan boasts a long history. China and Kyrgyzstan in June agreed to establish a comprehensive strategic partnership, openning up a new chapter for friendly cooperation between the two countries. China stands ready to work with Kyrgyzstan to actively promote the construction of the Belt and Road, intensify exchanges on experience in governance, and promote the mutually benefitial cooperation in culture and legislation, Wang said. Omurbekova said that Kyrgyzstan will further strengthen pragmatic cooperation with China and enhance friendship among the people. While meeting with Prodi and other guests, Wang said that China is committed to the path of peaceful development, calls for respecting the diversity of civilization, and advocates building a beautiful world featuring universal security, common prosperity, openness and inclusiveness. China is willing to strengthen cultural exchanges and mutual understanding with all parties and jointly promote the building of a community with a shared future for humanity, Wang said. The foreign guests expressed their willingness to actively participate in and promote exchanges between different civilizations and enhance mutual understanding and cooperation.